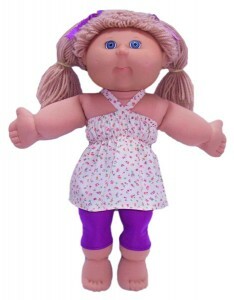 You asked for it, so I’m pleased to now have available my versatile Tights in the 18 ½ Inch Cabbage Patch doll clothes patterns size. Essential to all girl’s wardrobes are great mix ‘n match pieces and the same goes for dolls too! This tights pattern creates the perfect mix ‘n match basic for your doll to wear. Wear them under a skirt, with a big shirt or combine with my One Piece Swimsuit pattern for a great ballerina leotard and tight set. Make them shorter and they become ¾ length tights for the ‘in-between’ months or go shorter again and you have a great pair of bike shorts. The combinations and variations are endless, so you can see why I’m so excited to be releasing these Tights doll clothes patterns today. It is an easy to make, ‘must-have’ pattern to economically expand your doll’s wardrobe! Remember, when you purchase my downloadable PDF patterns and written instructions, you also receive LIFETIME access to my online video tutorial where I show you step-by-step how to make this great doll clothes pattern. Yes, all this online support absolutely FREE!